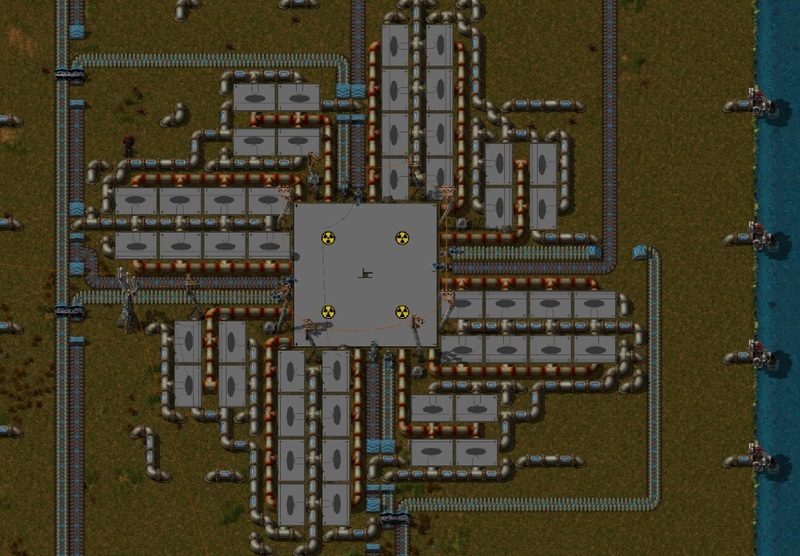 The prototyping of the nuclear power is 90% complete. Some parts of the planned stuff like cooling towers and closed water cycle were dropped. The main reason is that the jump the player needs to do when he wants to switch to the nuclear power is big enough already. The secondary goal is to not get too megalomaniac as there are lot of things our graphics department needs to handle for 0.15 already. We can always add these options later if we want to. I would like to make clear, that all the nuclear related graphics on these pictures are just a placeholders (made by me), the proper graphics will be done later. The first part of the process is mining of the uranium, which will be done exactly the same way as any other resource. The uranium processing requires a new entity called centrifuge, it uses 10 ores to create Uranium 238 and Uranium 235. The ratio is set to be as in reality, which means, the Uranium 235 (The better one) has only 0.7% probability. The uranium 238 itself is not enough to make the nuclear fuel, so it needs to be mixed with 235 again, but in bigger ratio than it had in the ore, specifically 5% of Uranium 235 needs to be in the mix. 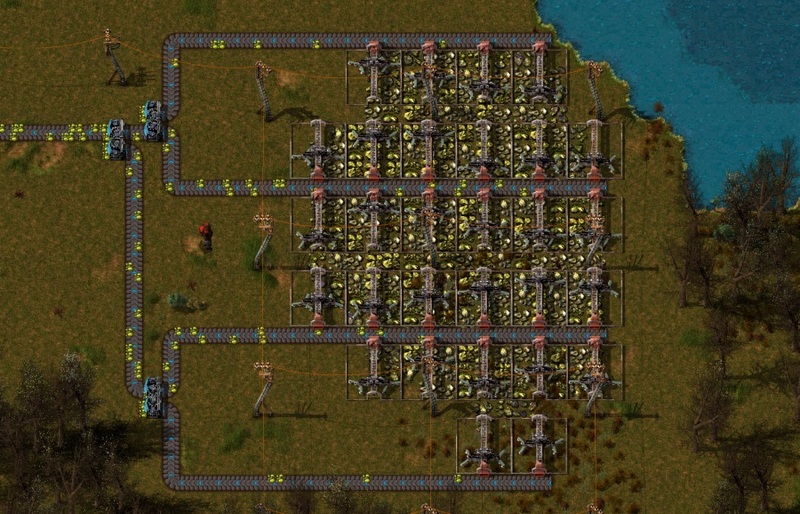 There are different ways to handle the problem of leftovers of Uranium 238 in the real life, but to keep things from getting too complicated, the Factorio player invented the "Kovarex enrichment process", which is able to solve this problem. Once the nuclear fuel is prepared, it can be inserted into the nuclear reactor, the most simple setup is one reactor with 4 boilers. For every neighbour reactor, there is 100% energy production bonus with the same usage of fuel. 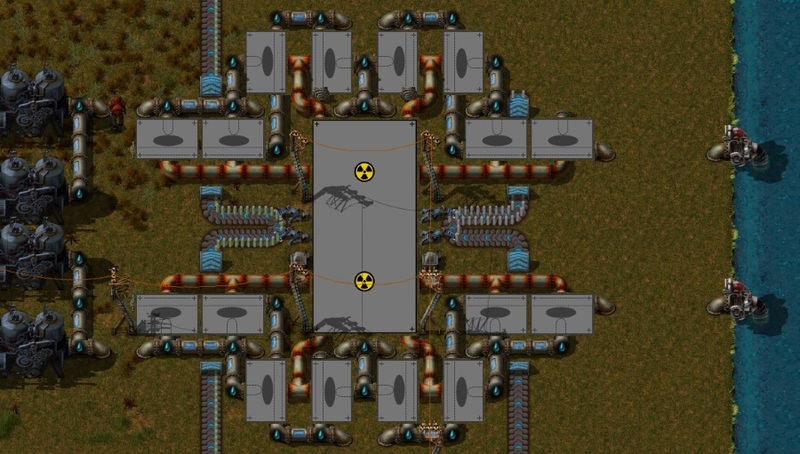 This means that 2 connected reactors are more efficient and powerful, but its heat can't be fully used without the heat pipes (the red pipe placeholder), as each reactor needs 8 boilers to be connected to it in this configuration. At this moment, there is no danger of the reactor meltdown, there is just maximum temperature of the reactor and the rest is wasted. We might add some risk into the reactors, but we might as well leave it as it is. One of the new researches in 0.15 is the mining productivity research. It is infinite and every level adds 2% bonus to the mined resources, similar to the way the productivity modules work. Its price increases linearly so its rate of return increases as well. It helps to greatly diminish the need to erase and build mines too often in bigger late game factories. As you might or might not know, Starcraft was always one of my favorite games. I spent way more time with it than I would like to admit. Some time ago, long before I started working on Factorio, I started the bwapi project which provides C++ api to access the starcraft data (units, players, map etc.) and allows to control the units. I didn't do anything with that for several years, and it lived its own life in the meantime, there are people writing ai as part of the university courses or just for fun and competition. There are tournaments of the AI bots every year since 2011, and the most amazing: Server that runs the bot battles 24/7 and streams it online at twitch.tv/certicky. They even use custom Module that automatically moves the screen around to show important parts of the map as the game runs, this is the true automation spirit! Why am I writing this? Well I'm working on Factorio for almost 5 years now and I need a hobby side project, and writing the starcraft AI is perfect for it. It is fun, complex and it is automation! So if you want to compete with my future bot and the other 45 bot programmers, you are welcome. And as always let us know what you think on our forums.